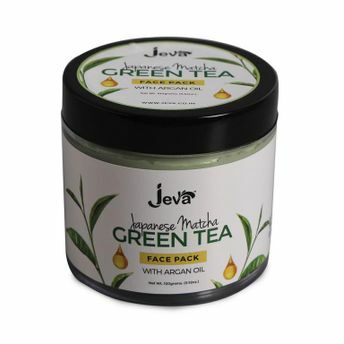 Jeva's Japanese Matcha Green Tea Face Pack with Argan Oil is a creamy and delightfully fragranced mask made from natural oil-absorbent clays that rejuvenates and revitalises your skin.Enriched with the goodness of Japanese Green Tea and Argan Oil, this instantly nourishing face mask spreads easily and leaves skin feeling smooth and refreshed. Loaded with hand-picked ingredients, this natural ingredient mask fights acne, removes excess oil from the skin surface and keeps it soft, supple and glowing. Antioxidant-rich Matcha Green Tea and the moisturizing benefits of Argan Oil blend together to give skin a healthy and radiant boost along with retaining skin's natural moisture. The face pack's soft and creamy formula is non-drying on skin, is easy to use and wash off. It removes pollutants and impurities from deep within and reveals radiant, younger-looking skin. A must-have product for all skin types. Explore the entire range of Masks & Peels available on Nykaa. Shop more Jeva products here.You can browse through the complete world of Jeva Masks & Peels .